This week, business executives, nonprofit leaders, government officials and issue advocates met in National Harbor, Maryland for the annual 3BL Forum (formerly Commit!Forum). 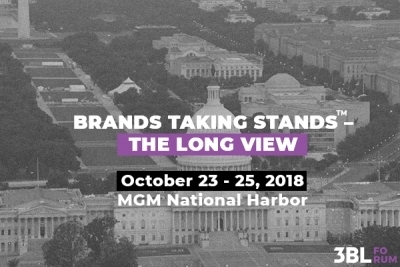 The theme of the conference was again “Brands Taking Stands;” yet this year, companies unpacked if, when and how they take stands so others in the audience could learn from leaders in the field. CEO Shana Deane kicked off this year’s conference by commending the nerve and grit of brands willing to speak up for divisive issues, and how taking a stand has reached new levels. Profitable Sustainability Sells: Legacy companies representing more than 400 years of business took the stage for the session, “Perspective from Legacy Companies: Innovations in Corporate Thinking.” Michael Okoroafor, vice president, global sustainability and packaging innovation at McCormick & Company shared McCormick’s approach, including a concept the company calls Purpose-led Performance – which means the brand is equally dedicated to strengthening its business and improving the world around it. This has allowed the heritage brand to remain competitive over the years, while also focusing on the betterment of the planet and society.